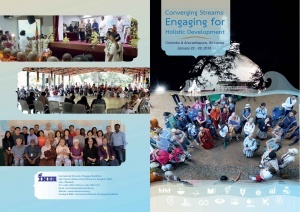 The 2016 INEB conference theme of Converging Streams: Engaging for Holistic Development – An Interfaith Dialogue for Peace and Sustainability encapsulated the issues and the approaches for addressing it. Conference activities provided many opportunities to increase understanding of holistic development on a range of topics including climate change, environmental resilience, development in the post conflict era, gender equality and the ordination of nuns to name a few. Various platforms for interfaith dialogue were integrated into conference activities to help people from many countries, cultures, social sectors and faith traditions interact in meaningful ways. Additionally, the conference was designed with an exposure into Sri Lanka’s development experience through the lenses of climate change and pluralism in the post-civil war context. Participants could be part of two study tours, one of which took place in the south focusing on ecosystems, climate change and sustainable development, and the second took place in the north focusing on the post-civil war situation, pluralism, inclusiveness and development. INEB recognizes that its network platform is reaching beyond its core group of Buddhist organizations in the areas of climate change, pluralism and peacebuilding. Nearly 200 participants arrived from 22 countries to attend the conference activities and experience which speaks to INEB’s inclusive and pluralistic values and approach for engaging across faith traditions, Hindu, Christian, Buddhist and Muslim, in collaboration on shared issues of concern. 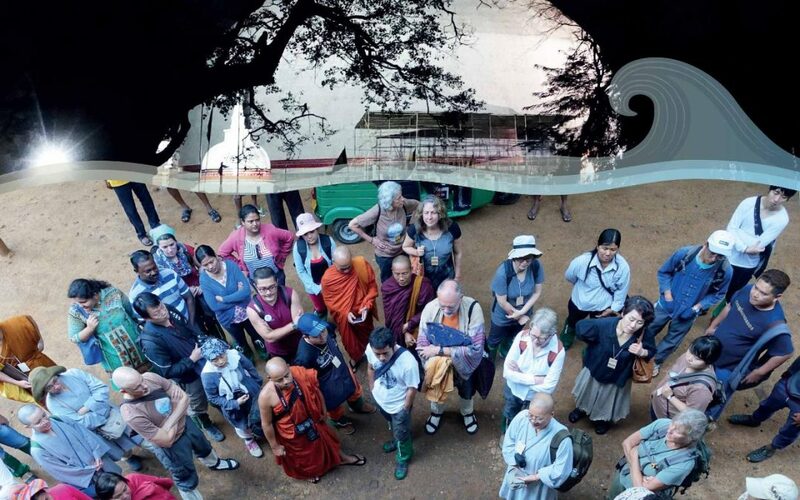 The conference activities took place in several locations and venues in the country, Jaffna in the north, the capitol Colombo, and in the south – the Islander Center, Anuradhapura, and the Sinharaja National Forest (Pinnawala and Kuruegala). All the pre-conference activities, in addition to the opening ceremony and public symposium took place in Colombo or a nearby location. This year’s conference planning and implementation involved more leaders from the younger generation of the conference organizers, INEB and Sevelanka. Keynote presenters and notable resource persons were available throughout the conference activities with expertise in the areas of holistic sustainable development, engaged Buddhism, climate change and environmental issues, as well as peacebuilding. Dr. Joanna Macy, scholar in the areas of Buddhism, development, general systems theory and deep ecology, with an extensive history of involvement in development in Sri Lanka, as well as nuclear disarmament in other parts of the world, presented at various conference activities including a pre-conference workshop, as the keynote speaker at the public symposium and as a conference panelist on structural violence. Other notable presenters included Dr. A.T. Ariyaratne from Sri Lanka that initiated and lead the Sarvodaya Shramadana movement which used participatory development approaches to build communities based on engaged Buddhist principles. Ajarn Sulak Sivaraksa who founded the Sathirakoses-Nagapradeppa Foundation, as well as co-founded INEB and the Spirit in Education Movement (SEM), presented on sustainable development and engaged Buddhism. Resource persons and participants alike shared a deep concern for peace and sustainability. The very essence of holistic development was carefully examined against the backdrop of structural violence in which its invisibility enshrines systems based on social, economic and political inequality that perpetuate conditions of poverty and unequal access to education, health care, the food supply and more. One clear message was that Buddhist monks, and leaders in faith traditions need to work closely in communities so they can become familiar with the spectrum of issues people face in their day to day lives. Through building relationship with local people spiritual and religious leaders can become more involved in helping to bring about social change from the grassroots level. Structural violence is one of the primary obstacles to holistic development projects. Presenters emphasized how deeply rooted it is as a source of violence that is part of systems and structures as it has been institutionalized and hidden within them. Being institutionalized makes structural violence that impacts people seem normal. Its coercive, conforming and corrupting character perpetuates inequalities throughout society which contribute to many conditions where access to education, water, economic benefits, health care, and input into public policies that directly affect people’s lives are all limited. Some of these conditions also are polluting the earth through the spread of agricultural chemicals, the use of nuclear energy, and using hydraulic fracking for natural gas supplies. All of these assaults against the natural environment and all beings are creating negative karma which will affect the children who are our future and the farmers who feed the world. The impact of structural violence was discussed in small and large groups where participants talked about its impact in their own lives. This new expanding awareness carried into the second day when they applied it to how through building partnerships, collaborations new ways would emerge for entering into holistic projects together. The relationship between structural violence and holistic development needs to be critically examined in order for development to be self-sustaining for the long term. The root cause of much suffering is based in greed and delusion that is manifested through rabid consumerism based on people’s feelings of wanting and inadequacy. The Middle Path in Buddhism directly confronts this greed and delusion and can be applied though using various development approaches. Everyone was reminded that the sum of the parts is always greater than the whole. This is an affirmation that all consciousness and life on the earth is interconnected and interdependent on each other in order to continue. Embracing inclusiveness and diversity brings new perspectives and vibrancy when working together. Removing exclusionary thinking and forming relationships across diverse groups will strengthen society as the grassroots level that establishes solid foundations for holistic development projects to be enduring. Using these approaches structural happiness is possible and more local, national, regional and international platforms are needed to make it a reality.